An interview and behind the scenes footage with Brandi Hagen, the award winning Principal Designer of Eminent Interior Design, gives the audience insight into the process, pitfalls, and professional touches involved in designing an amazing master bathroom. From studio to showroom to a final tour, Brandi focuses on client service and gives students a glimpse at interior design career opportunities. Interior designer Robin Strangis introduces the basics of interior design by giving a guided tour of decorating styles in the display rooms of a furniture store. She encourages people to think about three important things when decorating a room: personal style, how the room will be used, and who will be using the room. This beginner decorating video will help students to learn that anyone can make good decorating choices. Brandi Hagen shows students exactly what it takes to be an interior designer. Hear Brandi discuss the education needed to succeed in the field, and the pros and cons of a professional interior design career. 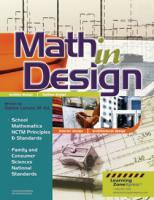 Math in Design combines sewing, interior design and housing with basic math concepts in fun, practical, real-life scenarios. Worksheets incorporate hands-on applications of math in everyday life that are right at home in the FACS or math classroom. Anytime you create something, a sketch or a skyscraper, you are designing. Explore the ELEMENTS of design - color, line, shape, form, pattern and texture - in the usual design disciplines: interior, clothing, landscape, and architecture, as well as more unusual venues, like the family dog, kids and professional models. John Ewoldt is a specialist on bargains! As a columnist for a major newspaper, his column is Dollars & Cents. John shares his advice on furnishing your space, whether a dorm room or an apartment. 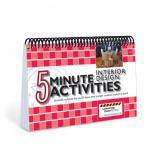 Interior design on a budget! A lively, entertaining, quickly-paced video narrated by an award-winning actress! Take your students on a whirlwind tour of the natural world, the fashion world, ancient times, modern past-times, interiors, exteriors, and everything in between for a thorough grounding in the PRINCIPLES of design; balance, rhythm, scale, and harmony. A video to help students understand the most powerful tool in decorating � COLOR! The right colors can calm, stimulate, create emotion and energy, make objects appear larger or smaller � and it is believed by some that colors can aid in healing. This fast-paced, informational video gives an overview of many housing styles in America. Some styles featured include: Colonial, Tudor, French, Neo-classical, Spanish, Victorian, and more. Throughout the video, architectural terms are provided along with time periods of popularity and specific characteristics of each housing style. Six teen girls give tours of their own bedrooms and offer creative and fun ideas for designing teen bedrooms! 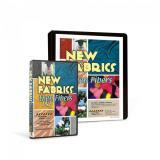 Kit includes: New Fabrics, Then Fibers Video and New Fabrics, Then Fibers Lesson Plans. Create a unique and fashionable look using second-hand thrift store clothing for your next sewing project! Instructor Kimberly Oedekoven explores her local thrift store while explaining what to look for when shopping and practical thrifting tips. This quick and easy way to determine your furniture needs and placement is used by home owners, students, interior designers and architects. 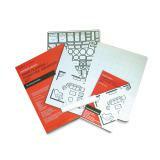 This kit contains over 120 magnetic furniture pieces, magnetic grid board, 1/4" scale and more. A definition of fiber, properties of fibers, fiber categories (natural and manufactured), and new fibers that have recently been invented are topics covered in this educational video. Your students will learn the process of how fibers are woven into textiles and the uses of different fibers with this practical video.